Kick back and get the kettle on. Here’s some of our favourite pieces from the past seven days. 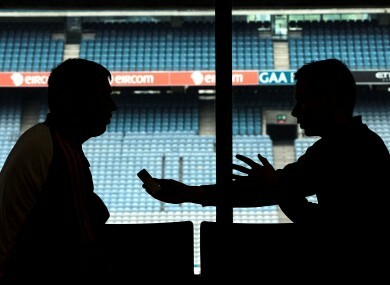 Nigel Dineen, Roscommon U21 manager, is interviewed at Croker this week. A century go the Titanic sank into the north Atlantic; two of the world’s top tennis player survived but in very different ways. Check out this piece by L Jon Wertheim on Sports Illustrated. There’s been plenty of ink spilled since the tragic death Junior Seau this week. This piece on Esquire is a good starting point. The Boston Globe’s Leon Nayfath describe one man’s mission to bring statistical analysis — that staple of modern US sports — to the chaotic world of mixed martial arts. The Guardian’s Kevin Mitchell on Pedro Diaz, Miguel Cotto’s Cuban trainer. This was the most intriguing piece of the week for me, Jeff. Deadspin asks some probing questions of ESPN’s hottest new columnist. She doesn’t work for Bristol anymore. 6. “‘My name is Jerry Joseph,’ Guerdwich Montimere tells me. ‘I truly don’t think he thinks he’s Guerdwich Montimere,’ Permian coach Danny Wright says. Sticking with America’s favourite sports network and the question of the sporting imposters, Wright Thompson investigates the curious story of Guerdwich Montimere, a high school basketball star who may or may not be 22 years old.